Former Republican Sen. Edward Brooke Dies At 95 : The Two-Way Brooke was the first African-American to be popularly elected to the U.S. Senate, serving in the chamber for 13 years. He was a major champion of fair housing laws. Former Massachusetts Sen. Edward William Brooke speaks in the Rotunda on Capitol Hill in Washington, in 2009 during a ceremony where he received the Congressional Gold Medal. Brooke died on Saturday at age 95. 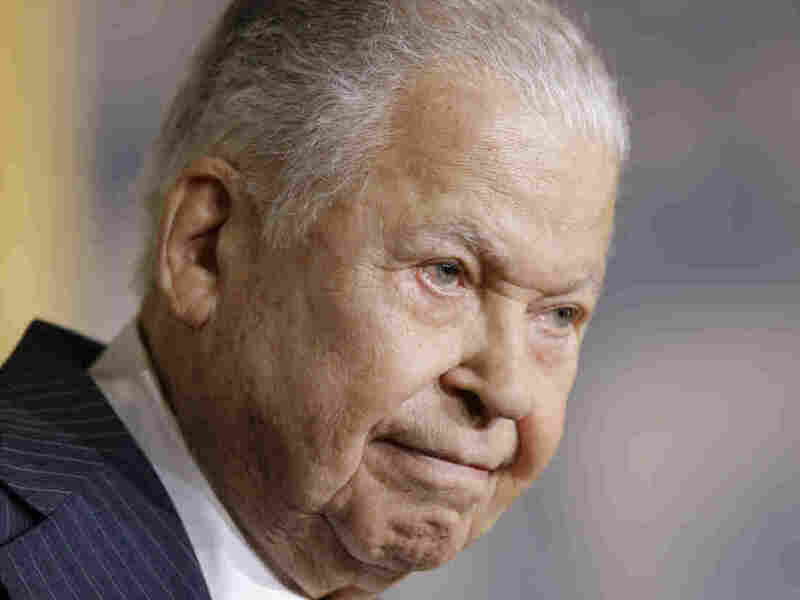 Former Massachusetts Sen. Edward Brooke, the first African-American to be popularly elected to the U.S. Senate, died Saturday at age 95, a family spokesman said. Brooke, a Republican who had been Massachusetts attorney general, was first elected in 1966, defeating former Massachusetts Gov. Endicott Peabody. Brooke served until 1979. He died at his home in Coral Gables, Fla., surrounded by his family. He was a leading advocate against discrimination in housing and, along with Democratic Sen. Walter Mondale, co-authored the 1968 Fair Housing Act. In 1969, he led a bipartisan push to defeat President Nixon's Supreme Court nominee, Clement Haynsworth, who faced opposition over allegations that he favored segregation and had failed to recuse himself from cases where he had a personal financial stake. The Boston Globe writes: "Mr. Brooke's eminence had a paradoxical aspect. What made him such a figure of racial progress wasn't his emphasizing race but transcending it. He had no choice: The year he was elected attorney general only 2 percent of Massachusetts voters were black." "[He] entered the Senate with Charles Percy and Mark Hatfield. A year before, John Lindsay had been elected mayor of New York. All four men were vigorous, telegenic, forward looking. They seemed the cutting edge of a new, revived GOP, turning to the center after Barry Goldwater's landslide defeat in 1964. Instead, the new, revived GOP belonged to Goldwater — and Ronald Reagan." After the Senate, Brooke practiced law in Washington, D.C., and served as chairman of the Boston Bank of Commerce. Later, he was named to the board of directors of defense contractor Grumman. In 2004, President George W. Bush awarded Brooke the Presidential Medal of Freedom and in 2009, he was given the Congressional Gold Medal. In a statement Saturday, President Obama said Brooke "led an extraordinary life of public service, including his time in the U.S. Army." Brooke served in combat during World War II, and earned a Bronze Star. "As the first African-American elected as a state's Attorney General and first African-American U.S. Senator elected after reconstruction, Ed Brooke stood at the forefront of the battle for civil rights and economic fairness," the president's statement continued. "During his time in elected office, he sought to build consensus and understanding across partisan lines, always working towards practical solutions to our nation's challenges."